The Top Of The World Trade Center Observatory was located in the WTC South Twin Tower #2. It had an indoor & outdoor observation deck that delivered a 360 degree view of New York City, allowing visitors to see up to 50 miles away with clear skies. 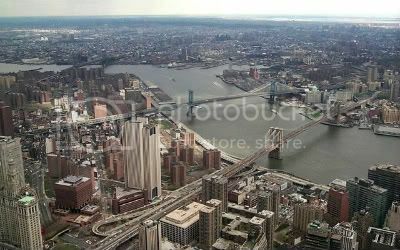 Once purchasing the Top Of The World Trade Center Observatory admission tickets, spectators were taken on a six minute virtual helicopter ride heading out of Verrazano Bridge, flying over Central Park, through Times Square & back to the World Trade Center buildings. Kiosks were located at various points in the exhibit verbally explaining the displays in a number of languages. The Top Of The World Trade Center Observatory was complete with gift shops, a pro shop even a food stand structured like a subway car advertising Sbarro & Nathan’s Famous Hot Dogs. From the 107th floor, visitors took an escalator to the 110th floor to experience breath taking views of all of Manhattan. 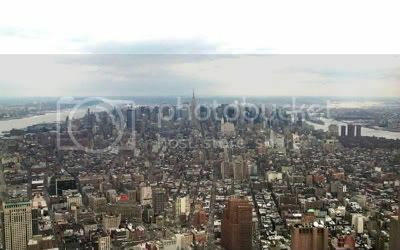 A view from the 110th floor of the World Trade Center South Tower was unlike any other with sights of Rockerfeller Center, the Met Life Building, the Citigroup Center the Chrysler Building & the Empire State Building. Although there was an anti-suicide fence built to protect patrons from falling or jumping, it did not obstruct the observatory’s spectacular views. This is the Adult Admission Ticket purchased just 19 days prior to 9/11. This ticket was printed inside the WTC before the tragedy. All remaining tickets & the printer used to print them were destroyed on 9/11. This is an unused WTC Ticket complete with the original perforated attached stub. Mint unused tickets are very rare as most were used to visit the World Trade Center Observation Deck. The tickets came in two types: Adult & Child. Most tickets purchased were the adult tickets & therefore there is an approximate 10 to 1 ratio of adult to children tickets that were ordered. This makes the Child ticket incredibly rare & even more valuable! When the Twin Towers were destroyed on 9/11 the Top Of The World Trade Center preferred agent 'Piccolo Gift Shop, Inc.' was left with unsold tickets & in desperate need of funds. Before the tragedy they sold WTC tickets individually & as part of a special tour package. To help keep their business viable they sold these tickets & this WTC ticket is from their collection. We are selling this adult ticket as well as the rare child's ticket in our eBay store. This comes with a copy of Phil Piccolo's Validation Statement (Mr. Piccolo is president of Piccolo Gift Shop, Inc.) & a copy of the Piccolo Gift Shop Receipt Statement. The Top Of The World Trade Center Observatories Deck Ticket on this post is part of our personal Cool Collectibles Collection & can be purchased in our eBay Store. For more INFO & PICs of our Historical & COOL COLLECTIBLES please click above.